And I pay an extravagant amount every month to do so--that's a New York City apartment for you! My friend from Toronto calls the space a "bitchen" meaning a bed in the kitchen. It does get annoying when you've had tea right before going to bed and need to scramble down the ladder in the dark at three in the morning. 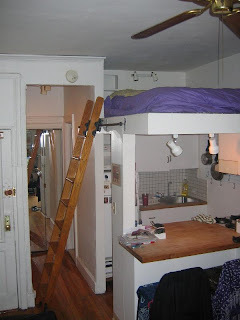 When sleeping, my head is less than a foot away from the ceiling. Luckily, I have avoided hitting my head frequently, but I have scratched my knuckles on the ceiling several times when grabbing my sheets and turning over in my sleep. Right now as I type I have two little scabs on my right hand, which look like a cat might have scratched me or as if I decided to punch a wall in a fit of rage. "They make the apartments in New York as hard to get into as Tylenol bottles and almost as big," said Caren Lissner's Carrie Pilby.